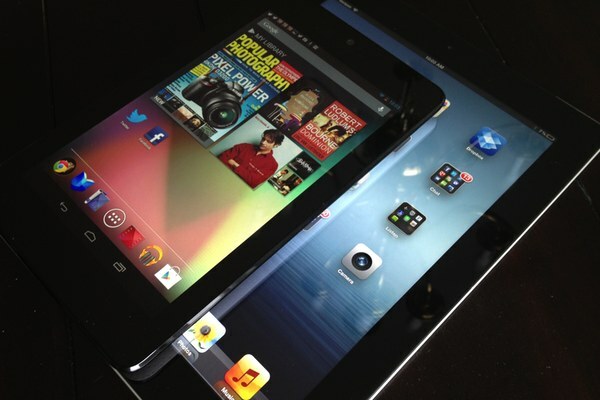 Google’s gonna get Apple (and they’re little tablet, too) — they are doomed. Or, so goes a single retail survey out of Japan that is making headlines. Despite the shouts of triumph from a few rambunctious fandroids, Apple still wins the Nexus 7 vs iPad battle because at the end of day that’s where the money is. You know what is better than selling out of Nexus 7 docks in UK? Being number one in Japan. Japan’s Nikkei surveyed 2,400 electronics stores and discovered that Google’s Nexus 7 tablet 44.4 percent of tablet sales versus just 40.1 percent for the iPad. That said, they highlight the fact that the Nexus sells for $100 less than the iPad mini and also that Apple’s smaller tablet was sold out at many stores. There have also been whispers here in the US that Android-powered tablets have stolen market share from the iPad, though Apple is still dominate here. But, as so many commentators like to say, market share is only one metric to consider when reckoning which company owns the tablet space. Whether its Mac vs PC, iPhone vs Galaxy or iPad vs Nexus, it pays to follow the money and Apple utterly dominates in terms of profit with a more than 75 percent share.